I am extremely happy with the Breville JE98XL Juice Fountain Plus 850-Watt Juicing Machine. I have wanted a Juicer for a very long time now, but the ones I fell in love with cost two hundred dollar or more. As a first time juicer, I wasn’t sure I wanted to drop that kind of cash to have it collect dust in the cabinet. And, I didn’t want a low quality cheap one, because I would hate to not get the most out of my produce when I juiced it. So, I landed on the Brevelle JE98XL Juicer, which retails for $200 but is often found priced at less. The first thing I would like to mention is functionality – this thing is incredible! It easily pulverizes apples and larger fruits and vegetables, because it has a large chute. It also juices very, very quickly. This juicer has two settings, high and low, and it switches easily between the two for constant juicing. 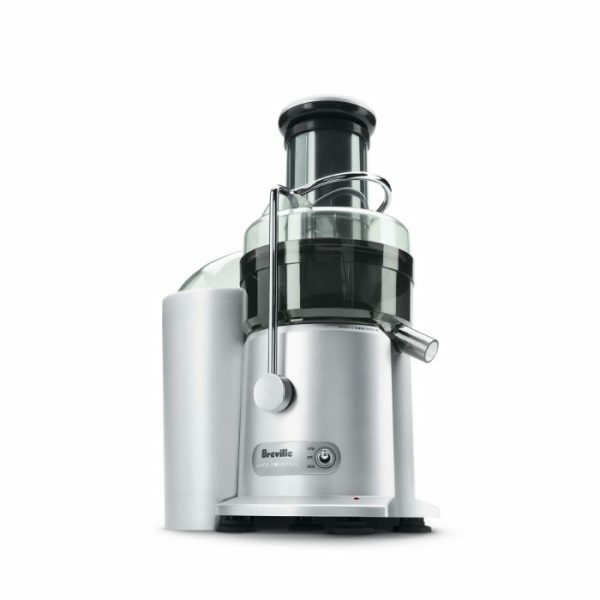 The Breville Juice Fountain Plus Juicer is quiet for its size. I expected it to be very loud and for it to vibrate around the counter top, but it didn’t. It’s noise level was very reasonable, and it did not so much as jiggle on the counter when I turned it on. This juicer is very sturdy and stable and produces less nose than you might expect. Cleanup, it really is a breeze if you use a couple of tips. I highly suggest using a plastic baggy in the waste container (where you catch the pulp). It makes cleanup effortless and keeps the mess contained to the baggy. the Breville JE98XL Juice Fountain Plus 850-Watt Juicing Machine is dishwasher safe, which is excellent. Considering that this machine takes fruit and veggies, completely obliterates them, spins a gazillion times per minute, and separates juice and pulp from each other, clean up really is a snap. I’ve made more of a mess using a knife to slice and orange and having orange juice all over the place. The Breville JE98XL Juicer has a simple modern design, everything locks and unlocks really easily, and there are no difficult nooks and crannies to scrub. Easy cleanup is definitely at the top of my list of features for this juicer. Its cleanup definitely wont discourage you from using it like some other models I have researched, where the fresh juice didn’t justify the insane cleanup process. Honestly, if you simply rinse the parts under hot water immediately after you use it, there is virtually no cleanup. Bigger is better, right ladies? The Breville JE98XL Juice Fountain Plus is big. I want to mention this because it is important that you know about the size of this Juicer. It’s quite large, and I’m glad it is! If you live in a tiny one room apartment and hope to squeeze this in next to your hot-plate, this is not for you. However, if you have a little counter space to spare or a nice spot to store it while not in use, I do recommend this one. Like i mentioned before it makes quick work of apples and larger fruits and veggies. It is unlike other juicers with regards to its size and the chute is plenty big for everything you would need to run through it, without having to cut or chop first. It’s big, it’s luxurious, it fits well with any kitchen decor, is priced right, which makes it one of the best investments I have made. Remember this is not just an investment in a kitchen appliance, it’s an investment in your health! Now onto the price. This machine is a bargain, compared to the price of other juicers! It’s bigger, more powerful, easier to clean, and will even look nicer sitting on your counter top. This Breville JE98XL Juice Fountain Plus 850-Watt Juicing Machine does the exact same thing more expensive juicers boast about – all while blowing the less expensive juicers clear out of the water.